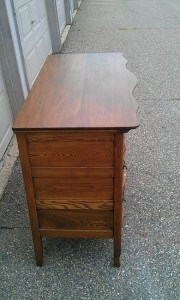 Greg and I picked up a third dresser for another project over the weekend (making it the 6th this summer). 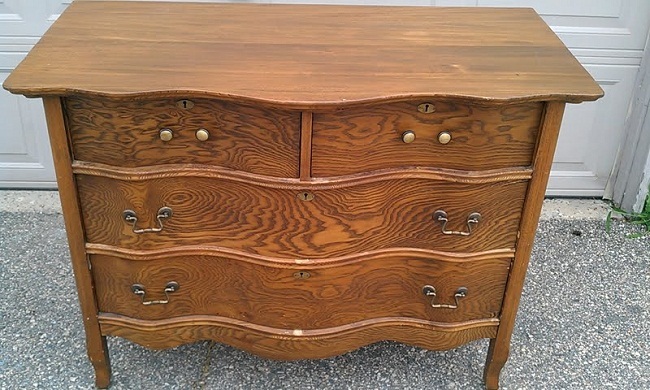 A bit rough, heavy and haggard with an unattractive wood grain made worse by the stain…but there is potential. This one screams paint me. It also screams take me apart, repair my drawers and make me sturdy again. So we are. It’s currently completely apart around our garage where we will pick back up this evening. I have to keep telling myself it will be worth it. It’s curvy with paneled sides and is in need of an extreme makeover. I’m not a fan of the word ‘extreme’ because it is often misleading and quite frankly annoying. I can’t help but conjure those sport videos where the announcer cries out extreme something or other with every single mediocre task. But there is no other word that came to mind best describing its needs. We have a buyer for this one. Keeping an eye out for a piece that met her expectations, this one finally came on craigslist and we agreed it had potential. I’m awaiting the details of her paint requests and a small deposit. I don’t think I mentioned that we had two ladies request specific dressers while we were on vacation so we’ve been busy working to fulfill those orders. But if that falls through, we’re going to refinish them the way we want. One of the other dressers from the previous post fits the other woman’s request. So we do take orders and I do work hard to find a piece that meets your needs. I say that because more than one email from a craigslist-er wants to belittle our work by offering something insulting (we take offers but maybe offering less than half is a bad decision if you really want us to take you seriously) and oh, the spam mail! The etsy people get it though. 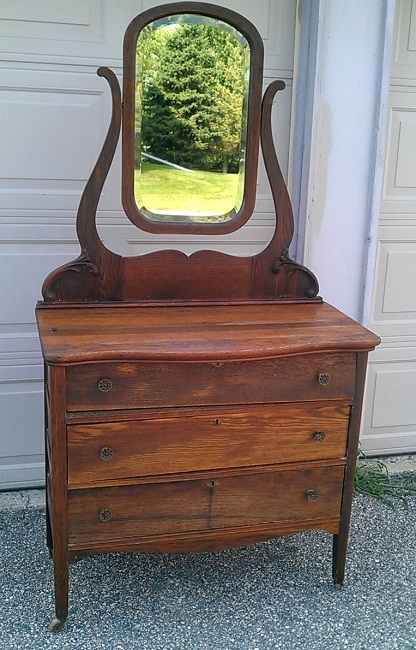 I know I’ve been asking for ideas about the dresser with the attached mirror (although that can be removed) and received a few regarding stains in place of paint. However, we spent some time in the ol’ garage this weekend and after closer inspection, believe it’s going to require paint. Too many chips and an unattractive grain pattern. I have to be completely honest and say that I’ve had a color in mind since we picked it up: turquoise (aqua/teal/whatever you want to call it). 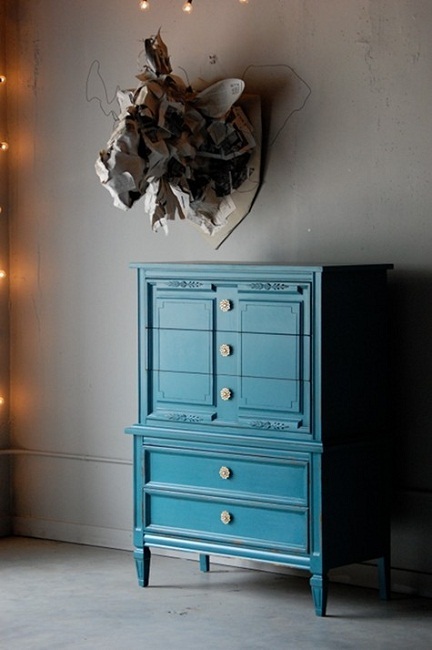 Something like the dresser below from Barb at Design Sponge. One of my absolute favorite websites. There are a few more inspirational designs on my DIY Pinterest board. Another site I can’t imagine being without. Do you Pinterest? 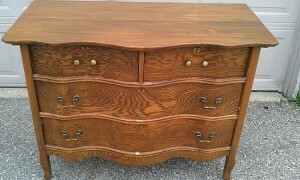 I’ll be back with more pics of our “taking the 6th dresser apart” process sometime soon.